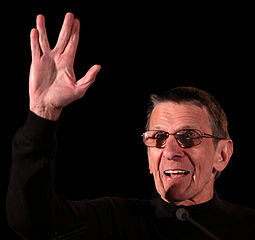 Leonard Nimoy signs “Live long and prosper” Original image by Gage Skidmore, via Wikimedia Commons. After an exciting and successful opening year, Heriot-Watt’s undergraduate degree in Sign Language Interpreting will welcome a new group of students in September 2013 (and, at the same time, applications will open for the 2014 intake). We’ve designed the programme to take advantage of LINCS’ decades of experience in educating spoken language interpreters to the highest levels. And we’ve tried to learn from previous attempts to prepare ready-to-practise sign language interpreters elsewhere in the world, drawing upon our own experience, as staff, of delivering training in England, Australia, the USA and around the globe. We’re committed to ensuring that Heriot-Watt’s students will be worthy of the full professional recognition that they will automatically receive on graduation from the registration authorities (SASLI in Scotland and NRCPD elsewhere in the UK). The profile of sign languages is increasingly visible, on a global scale. Just last year, Mayor Michael Bloomberg’s sign-language interpreter Lydia Callis became a star overnight when she interpreted the Mayor’s hurricane warnings to New Yorkers. American Sign Language has become one of the most popular language classes over there, ranking fourth in the latest Modern Language Association Survey — and nearly shoving German from third place. The number of students taking the language has risen by more than 50% in the past decade. Make no mistake, British Sign Language (BSL) is heading in the same direction. Even a decade ago, it was reported to be the second most popular vocationally-related evening class after First Aid. It’s certainly going to be an invigorating workplace for them future SLIs. Let’s see – what kinds of things might they have been up to this summer? Well, SLIs are a regular fixture now at several major music festivals, starting with the biggest of them all, Glastonbury. Fancy yourself interpreting the Rolling Stones, Arctic Monkeys or Emeli Sande, in front of 100,000 dancing revellers? Yup, it happened. (The young at heart can see how Blue Peter presenter Barney Harwood got on when he tried his hand as an SLI at the recent Latitude Music Festival in Suffolk on August 1st!) At the Edinburgh Fringe in August, there will be all manner of interpreted shows, from comedy to Shakespeare. But it doesn’t have to be glamorous to be rewarding. Some of the most important work is being done in contexts like the NHS24 pilot service for BSL users. Here, interpreters are working towards ensuring that we never see a repeat of the incident in May this year when a Deaf patient in Dundee was hospitalised for 12 days without access to an SLI, and so without effective communication with healthcare staff. To prevent such problems, we’re working closely with NHS24, and with Mark Griffin MSP who is aiming to bring a BSL Bill before the Scottish Parliament later this year. It’s recognised around the world that SLIs have actually led the way for spoken language interpreters in the community, too. Back in the 1980s, SLI research was trailblazing in recommending new practices in the field – in particular, carving out a more open, collaborative approach (developed in work like the book ‘Interpreting interpreting‘). Deaf communities are relatively stable (whereas the numbers in other minority language populations tend to fluctuate). Also, disability legislation ensures that BSL users have legal entitlements to appropriate services. This means that the SLI profession has taken shape more quickly – SLIs’ working conditions, and salaries that reflect their commitment to graduate-level education, are well established. Looking into our crystal ball, we can see the likelihood of more services being provided through video technology. Companies like SignVideo are showing how this can work well for both SLIs and consumers. International travel and video-chat facilities mean that Deaf and hearing people from around the globe often encounter each other these days. So SLIs can expect to provide services more frequently using what’s called ‘international signing’ (IS) – the kind you can see World Federation of the Deaf President, Colin Allen – a recent guest to LINCS – using here to introduce the annual ‘International Week of the Deaf’. IS may look the same as BSL to you, but it’s actually quite different, and requires amazing visual thinking and kinaesthetic skills. One thing’s for sure – there’s rarely a dull moment in this line of work. If you are a translator, interpreter, sociolinguist, anthropological linguist or any other kind of linguist, there is a lot to get annoyed about. Courses are closing, rates are (in places) dropping, respect is on the wane and hardly a day goes by without some newspaper publishing a story about some new gadget that will entirely automate some way we use language. If we didn’t know better, we would say we were all going to be out of our jobs by Christmas. True, there is a lot to complain about. True, due to something fundamental about the nature of social media (or should that be “human nature”?) negative posts and comments will get more views than positive ones. But does that make it right? I write this post as either a complete hypocrite or a reformed addict, depending on how you see it. I have written some negative and sarcastic posts in my time. Yet nowadays, I often wonder whether we might actually be shooting ourselves in the foot if we are too quick to react with negativity. Back near the beginning of the blog, I wrote a post calling for us to start changing the public face of languages. Late last year, I reprised the same theme and appealed for linguists to start demonstrating the value in what we do by showing exactly what we add to society. Today, I want to bring back the same theme again but with what might be a more personal challenge. Are we portraying a positive or negative view of life as a professional linguist? If you are a 16 or 18 year old choosing what career you will train for, I think you would be looking, at least partially, for a career where people seem positive about what they do. Surely, aside from purely economic calculations, people want to have a job they will enjoy, among people who are helpful and friendly. Now, to be absolutely fair, I must say at this point that the vast majority of linguists I have worked with, at all stages of my career have been friendly, happy and passionate about their work. Part of what makes this industry so great to work in is that you will come across some truly amazing and inspiring people. Sadly, that image of careers in the language sectors is not always the one portrayed in the press and even, I hate to say it, by linguists themselves. Often, in our justifiable and even justified need to fight for a cause, educate clients, improve practice, etc, we forget to sell the positives too. Yes, some clients don’t behave the way they should but surely the good ones deserve as much (if not more) publicity as the bad ones. Yes, there are unfair contracts and court interpreters are often mistreated but surely the examples of professional court interpreters giving a superb service are as worthy of collection as instances where interpreters have failed to show up and do a good job. Perhaps even our most justified campaigns for better treatment, more funding, less course closures and the like would be even more powerful if gave as much space to positive examples as we did to negative ones. To those who say that closing language courses is “what everyone is doing”, we can say, that, actually no, universities like Heriot-Watt are creating courses and hiring more staff. To those who say that interpreting is a wasteful expense, we can say, no, interpreters have always played a vital role in delivering fair, just trials, and economic growth. Some of the most powerful cases we can put for the value of languages come from the places where languages have made a positive difference. Some of the greatest arguments for the value of our work come from stories of happy clients, treated patients, and bestselling books. Maybe we need to work even harder at putting a smile on our public face. You read her guest post last month. Now read what Michelle Hof, aka InterpDiaries thought of the first ever Edinburgh International Research Summer School. If you are disappointed that the submission date for abstracts to the IPCITI conference has now passed, we have good news for you: registration is open and will remain open until one month before the start of the conference. With a lineup of guest speakers including: Claudia Angelleli, Delia Chiaro, Elena Davitti and LINCS’ own Chair of Intercultural Communication, Jemina Napier, it’s a conference you won’t want to miss. For more information and the chance to register, visit the IPCITI 2013 website. We are lucky. We have internet. I know, I know, computers are only good until they crash, internet connexions can be shockingly slow, clients will send materials in the weirdest and most wonderful formats and we don’t always automatically get given the wifi access codes at a conference. Appalling, right? And yet despite all these stressful aspects, internet has revolutionised interpreter training and the interpreter’s life. How? Well, let’s start with interpreting practice. In the good old days, if you wanted to practice simultaneous interpreting, you depended on tapes and language labs to record yourself and to listen to yourself afterwards. That meant that practice with the possibility of self-monitoring – an essential part of the learning process – was limited to contact hours in the classroom, or for the better-equipped universities, to hours spent in the self-study lab. Why? Because the recording was done simultaneously on the B track while the speech rolled on the A track. So listening to the speech on a normal cassette player was possible … but your own recording would play backwards on a standard tape-player, unless you used a language lab deck! Cassettes were clumsy, cumbersome to transport for poor lecturers (let’s not forget the lecturer’s plight!) and only one student could practice with each cassette at a time. Was it all that bad? Well, to give the “vintage” technology its due, it did foster more collaborative work between students who found themselves working at the same time in the lab. Would I go back to tapes? No, definitely not. For one, e-technologies mean that access to practice materials is now much easier, constant, and not limited to a specific location. Now, on top of the study lab (which was retained, for the cooperative use), Heriot–Watt students for instance have access to purpose-made materials via our virtual learning environment platform; practice speeches are uploaded on each relevant module space, and are accessible from anywhere, at anytime. Each interpreting training institution have their own set-up, but remote access to materials, in more flexible formats like mp3 or mpeg files, have facilitated training. And of course, most international institutions also make speeches available online in one form or another. The DGI has even developed a special training speech repository, to which a number of interpreting training institutions also have access. What of the recordings? Well, technology has also helped a great deal on that front: freeware like Audacity make it very easy for lecturers and students alike to record themselves, to create practice materials or record their performance. And of course, nowadays, most students have their own laptop or phone (smart or not) with at least audio recording facilities, if not video. But the greatest difference relates to preparation, for trainees and professionals alike. In the olden days, interpreters relied on physical dictionaries and paper documents, which were often only available in good university libraries, to which you had to go in person providing you were in a city with these facilities. Nowadays, a lot of background research can be done through online search engines like google, which can provide you with explanations and images (a useful tool when working on an engineering conference, for instance). Glossary searches are also greatly facilitated by online tools like IATE, ran by the EU, or by online dictionaries like “le grand dictionnaire terminologique”, a favourite of Fr<>Eng interpreters. And the internet can also, to an extent, be replicated the face-to-face exchanges in the self-study lab: students can work cooperatively on glossaries and background research through platforms like google drive and wiki tools, in the same way that professional interpreters will often share their preparation and glossary with their booth partner via email in the run up to their assignment. Of course, it means that interpreter training has changed: we need to update our skills and methods, in order to show students how to work with these new resources and how to get the best out of them without losing the key professional skills that were at the core of the pre-internet training. But the age of the internet has widened our resources and given us the tools to train even better, and to develop our skills throughout our professional career. The catch? There’s no limit to how much resources we can access at a click, so expectations are higher. The impetus is now on us to provide even better quality interpreting. Before I get into the subject of today’s post, I want to start on common ground. The language industries and especially the translation and interpreting professions are built on trust. There has to be a great deal of trust between clients and agencies, agencies and freelancers and even between competitors. In that atmosphere, some things are just not morally right. One of these things is “client poaching”. It would be wrong for freelancers to use the information they receive as part of a job for their own benefit and this of course includes names and phone numbers of end clients. It would be a complete breach of trust and incredibly unprofessional for a freelancer to give the end client a sly phone call, rubbish the agency and steal the end client. That said, in theory at least, that particular situation should not arise as such information should be routinely deleted by agencies and it should be the case that agencies and freelancers are not direct competitors. Agencies and freelancers should offer different services and the benefits of working through an agency should be clear to all involved. Sadly, theory and practice don’t always meet. If, for instance, the agency does little more than pass the text in one direction and the cash in the other, then there is an argument that the client and the freelancer are better off getting rid of the middle man (or woman). This would especially be the case where the agency has not done any marketing or due diligence on the client before the project begins. In short, the less value the agency add, the greater the possibility for competition between them and the freelancers they work with. Is it ever acceptable for a translator or interpreter to work directly with a client with whom they have previously worked through an agency? If the freelancer has signed a “non-compete agreement” where they state they will not work with agency clients directly then the question is moot. If you haven’t signed a non-compete agreement, the question becomes more complex. If the end client is not happy with the agency and decides of their own freewill to contact the freelancer directly then what should the freelancer do? On the one hand, freelancers might well feel a sense of loyalty to the agency and may wish to try to rebuild any bridges. After all, it could still be in their interest to have the agency in the middle. On the other hand, direct clients do tend to pay more than agencies and it might just be simpler to work together directly. There are many professionals who would feel that, no matter the agreement in place, it is wrong to work directly with clients if we have only learned about them through an agency. In this logic, the practices of the agency are of much less importance than our professional loyalty. The problem with this view is that it ties the commercial future of freelancers to those of the agencies they work with. If the client is going to cease working with the agency anyway, then it is hard to see why the freelancer should pay for whatever the client feels the agency did wrong. It is impossible to “steal” a client if they have already decided to walk away. Since they are going to find another provider anyway, surely the freelancer is within their rights to respond if the client contacts them and if they have not signed a non-compete agreement. Of course, this assumes that the “blame” for the breakdown lies simply with the agency. Sometimes it is actually good to lose a client, especially if they cause more problems than they are worth. There are situations where a client choosing to change suppliers should raise warning flags in the mind of the freelancer. So the whole situation is far more complex than any simple principle could possibly cover. Behind seemingly simple issues such as who contacts whom, why the relationship broke down and the relationship between the freelancer and the agency, there is a plethora of possibilities, each with its own set of ethical and commercial dilemmas. So instead of offering a blanket solution, let’s have a debate. Where do you stand on the issue? Is it ever acceptable for a translator or interpreter to work directly with a client with whom they have previously worked through an agency? Over to you. Sign language researchers talk research!